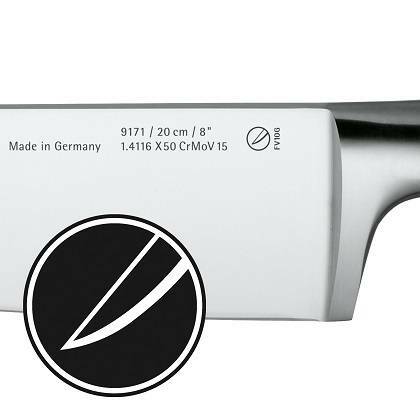 WMF knife blocks are the ideal partner for our high-quality kitchen knives. Protect your blades and enjoy the practicality of always having your knives to hand. 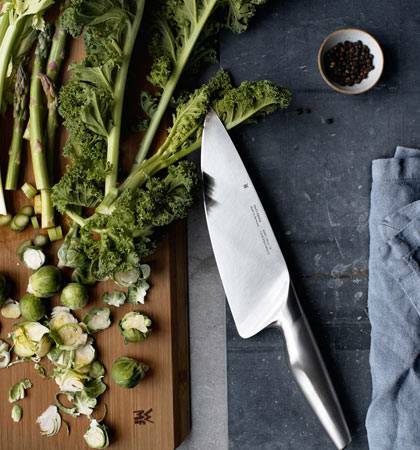 Every kitchen should have a high-quality knife block. It protects your high-quality kitchen knives from being damaged by incorrect storage and ensures that your knives are always close at hand. In addition, the WMF knife block matches the design of your kitchen perfectly. Choose a traditional wooden knife block or go for a modern design with knife blocks in a stainless steel finish. It's up to you! WMF knife blocks are as individual as you are! You can also choose your favourite shape. 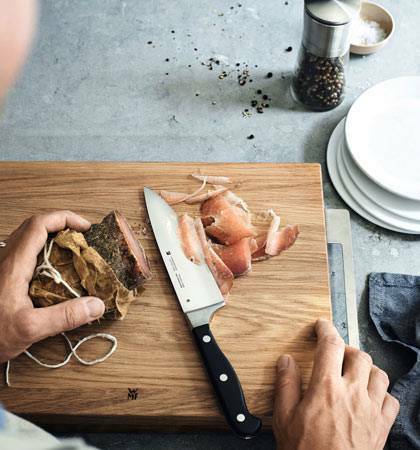 Knife blocks are no longer clumsy-looking chunks of wood. With the WMF knife blocks, you can have a modern, aesthetically pleasing accessory for your kitchen. In our Knife Block category, you will find different types of knife block for your kitchen. We offer knife blocks which are supplied complete with the matching WMF kitchen knives – the ideal choice if you want to add precise knives to your kitchen armoury and also ensure you have a suitable place to store them. 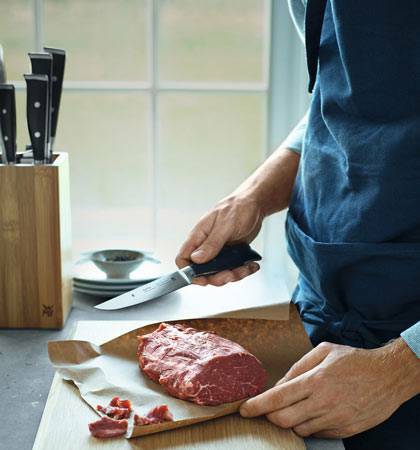 It goes without saying that all of our knife blocks with knives make ideal gifts for a housewarming or a new kitchen, as well as a wonderful treat for yourself. Our knife blocks without knives are the perfect solution for storing away your existing knife collection tidily. Here again you can choose between different designs. Knife blocks with bristle inserts are particularly popular, as they can be used to hold any knife. Magnetic WMF knife blocks are also a favourite with our customers. 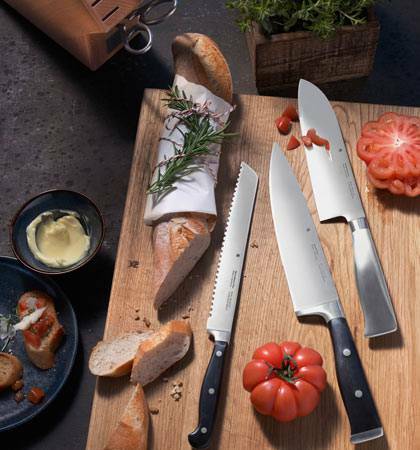 WMF offers a large selection of different kitchen gadgets, as we want to ensure every item in your kitchen is of the same high quality – from bread knives to vegetable peelers, the WMF kitchen world leaves nothing to be desired. In addition to our knife blocks, we also recommend our high-quality WMF knife sharpeners. With these knife sharpeners, keeping your WMF knives sharp is as easy as 1-2-3! 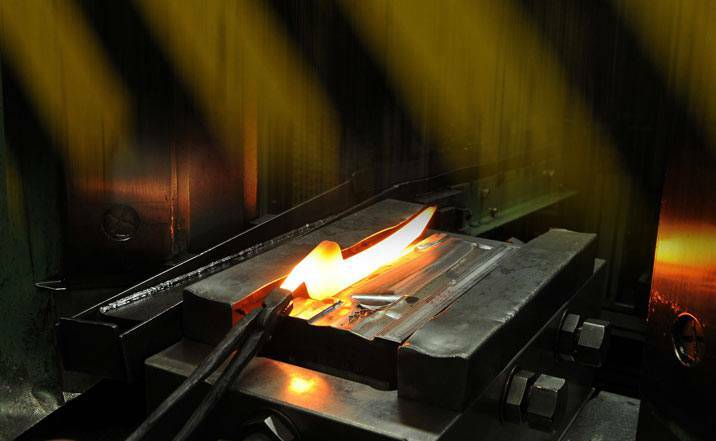 Our wonderful WMF steel is also found in this category. Be inspired by our selection and discover our offering for your modern kitchen.